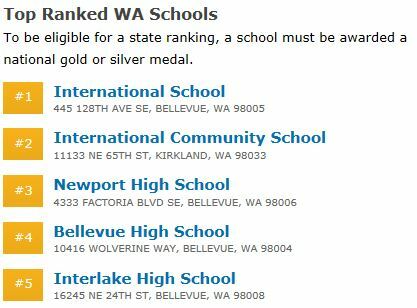 5 of the top 5 high schools in Washington State and 5 of the top 200 high schools in the nation are in either the Bellevue or Lake Washington School District, acording to the annual US News and World Report 2012 ranking. While not an uncontroversial ranking (it doesn’t include Bellevue’s football prowess, for example) it’s a well thought-through system of measuring how well high schools prepare students for success in college, AND how well they work with traditionally underserved populations. Trying to figure out how to have this kind of performance in all our schools in Washington is more difficult. A school and a district’s reputation drive population movement. Many people have moved to Bellevue and Lake Washington because of the schools. These tend to be people who value education, and consequently their students tend to do better in school. This drives the performance of the district, further improving in-migration of education-lovers. Interestingly, this also drives up home values.